I was recently reading an article in psychology today on over-parenting. That can be a hot button issue in and of itself, but stay with me here. The woman used several examples of kids being sheltered and things done for them, resulting in them being resentful or spoiled to the point they cannot take care of themselves or cope with the most basic of challenges in life. You are probably wondering what this has to do with dogs…quite a bit actually. As a dog trainer and educator, I am seeing this trend in dogs more and more. Owners with good intentions want their dog to just be ‘happy’. As a result, anything that makes their dog uncomfortable, seemingly sad or stressed is avoided as much as possible. Not crating a dog that destroys things in the home because they whine. Not trimming a dogs nails because they become fearful and growl. Not walking your dog because they are fearful of the leash or leash pressure. Not asking a dog to get off the furniture and respect their space or they will growl and snap. Adding people food to your dog’s food because otherwise they won’t eat their meal. Now just a disclaimer, we absolutely come across owners who won’t walk their dog anymore because of their bad behavior, or can’t have people over because of their bad behavior, but they want to resolve it, they just don’t know how. That is not what I’m talking about. I am referring to the situations you might avoid with your dog because you don’t want your dog to be unhappy or stressed, and that is what I address below. If you feel that could be you, hopefully this might help you seek additional advice on how to work with your dog. This is a common pattern we see with dogs as well. It could be something simple, like when a dog barks to demand attention, playtime or a treat and you give in to their ‘needs’. You wouldn’t think that it could affect their confidence in other situations where they might be unsure, but it does. If a dog feels in control for much of the day and then is challenged by something, like a scary truck or dog barking, they don’t feel like you could possibly be in charge of a scary situation and they will react accordingly. That could be by being nervous and fearful or reactive and bark at what they do not like. That often makes owners avoid those situations as much as possible instead of work through them. So what that scenario looks like for the dog is they remain feeling a certain way in stressful situations and they never get to work through that stress and build confidence to overcome it and develop better coping skills. Dogs will often notice when owners avoid those situations and the insecurity becomes more deeply rooted, all the while they are controlling their environment at home and getting what they want. One is greatly connected to the other. You can’t influence your dogs emotions or help them work through anything if they are able to control situations that seem harmless in the home. Another more obvious, but very common example is when dogs are held or pet (comforted) when they are scared instead of shown how to work through that fear. It’s common for us to think that they need it and we might see it help in the moment, but we are crippling their confidence or potential to gain confidence in those moments of angst. That is when dogs often become so reliable on our interaction with them that they will exhibit those fears more and more often in order to get that attention. It shows them they need more human interaction than they actually do so they will become heavily dependent on it, needy and can develop severe anxieties in other situations because of it. When we actively avoid stress it actually creates additional stress. In dog training we call it a snowball effect and it’s interesting that it happens similarly in people. As people we want to manage stress and teach our kids to manage stress rather than avoid it due of a host of issues it causes if we do not learn those coping skills. This is no different with dogs. Dogs need to be taught basic skills for how to deal with life. How to do that is another series of several blogs, haha, but knowing the importance of the time it takes to teach your dog how to fit into your life is very valuable. Don’t run from things that stress your dog out. Work with your dog with multiple techniques to overcome these difficulties. Every time your dog doesn’t want to do something or is stressed out, ask yourself how you might help your dog over come this challenge or improve upon how he feels about a stressful situation. That is what really grows and bonds a relationship in people as well as animals. It builds oodles of trust and confidence. Be aware of when you are doing something to potentially fill your own needs rather than your dog’s needs. Love, encouragement and support is so important in dog training or working with animals, but just like with raising kids it needs to be well timed while providing them skills to also feel competent and able to problem solve. 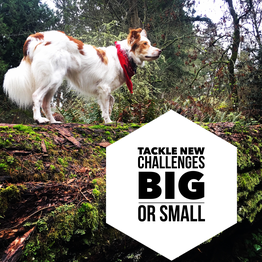 So, ask yourself this question, is there anything you might be doing with your pup that you are mistaking for nurturing and accidentally crippling your ability to confidently lead your dog through tough situations to help them grow and be happy? If so, start seeking out new things to do with your pup while recognizing the areas where you need to pull back on the attention you are giving or the areas where your dog tells you what to do. Some examples might be bringing you toys to play with, barking to go outside to potty every single time, barking to be let out of crate, jumping on your guests for attention, etc. Just a small tidbit of where to start working your dog that will help in stressful situations, you must start at home. Go on YouTube and find a fun obedience drill. Some examples of an obedience drill are Come, Sit, Break. Another easy fun one is Come, Place, Come, Place. These obedience drills can be done with food rewards and create muscle memory for when you need to use these commands to help your dog in a stressful situation. Let’s say someone knocks on the door and you ask your dog to go to their bed. If you don’t practice it regularly throughout the week over and over, and practice with people in the house, your dog will not be able to do it when an actual new guest comes over and they are over excited or stressed out. Start with the easy stuff and have some fun actively working with your dog on repetition with basic commands to create that great muscle memory associated with you.